In late winter, California fields and meadows think it’s spring. The first bit of rain brings back the green grass and a scattering of flowers. I decided to paint this one with a secondary triadic color scheme, ignoring some of the actual color in favor of adding a bit of harmony from a limited palette. That means, in non art-speak, that I chose to impose a color scheme upon the scene rather than painting exactly what nature gave me. And the color scheme I chose uses not primary colors (red yellow and blue) but the secondary colors they can be mixed to produce – orange, green and violet. This painting is now sold but I have others. The San Gabriel Mountains constantly change their colors through the late afternoon and early evening. Starting out as browns and greens, they become blue violet as shadows fall, and eventually reflect the warm colors of sunset. This scene captures a moment in that transition, from the vantage point of Hahamongna Park (formerly Oak Grove Park) in the upper Arroyo Seco between La Canada Flintridge and Altadena/Pasadena. Wildflowers billow and catch the warm light of the late afternoon sun. Yesterday I received some more good news about one of the many shows I’ve been entering. 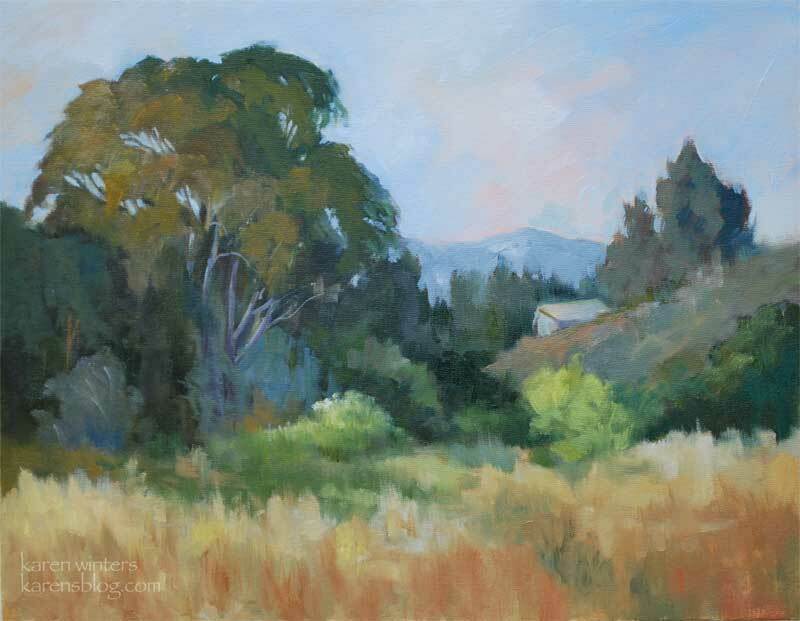 One of my plein air paintings, “Days End at Fallbrook” was accepted into the Laguna Plein Air Painters Association (LPAPA) 6th annual “Best of Plein Air” show. The exhibit will be at the Esther Wells Collection in Laguna Beach from July 17-25. I have been so busy this past week that I just woke up and realized that I haven’t posted in awhile, and I’ve had a hard time getting painting time in. The show is going well at Gale’s and I had a wonderful turnout for my reception. Many thanks to everyone who stopped by to see my work and say hello. So many friends, family and collectors – it was a day to remember. Special thanks to our children who drove down from Palo Alto for the weekend. We celebrated every moment, and enjoyed seeing UP on Saturday night. If you haven’t seen it yet, don’t miss it. Monday morning we took my entire show down at Gale’s to make room for her annual Taste of Art show – this year benefitting Pasadena’s Ronald McDonald House, which provides housing for families visiting sick children. 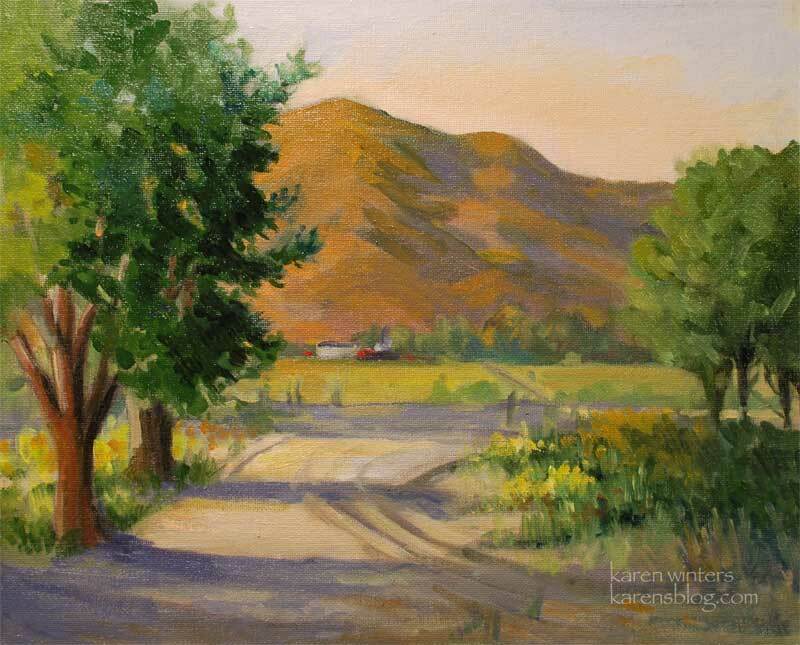 I donated a painting of the Casita Del Arroyo Garden, and was delighted to discover that the same couple bought it who bought one of my bridges last year. It was a great party – delectable appetizers and drinks, and good cheer all around for a good cause. Tuesday morning we rehung my show, which will continue now through July 10. 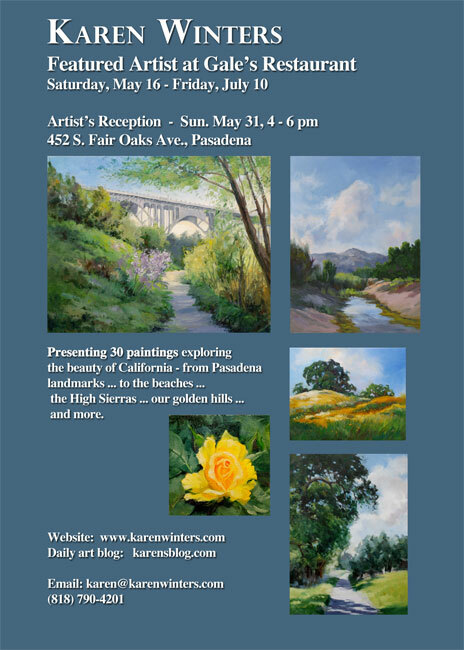 Now I’m framing 25 additional paintings to take to Rancho Santa Ana Botanical Gardens this Saturday and Sunday, June 6 and 7, in Claremont for the Art in the Garden show and sale. This is the third annual juried event and I’m happy to be participating for the 2nd time. The gardens are at 1500 N. College Drive if you live in the inland empire and would like to come say hello. 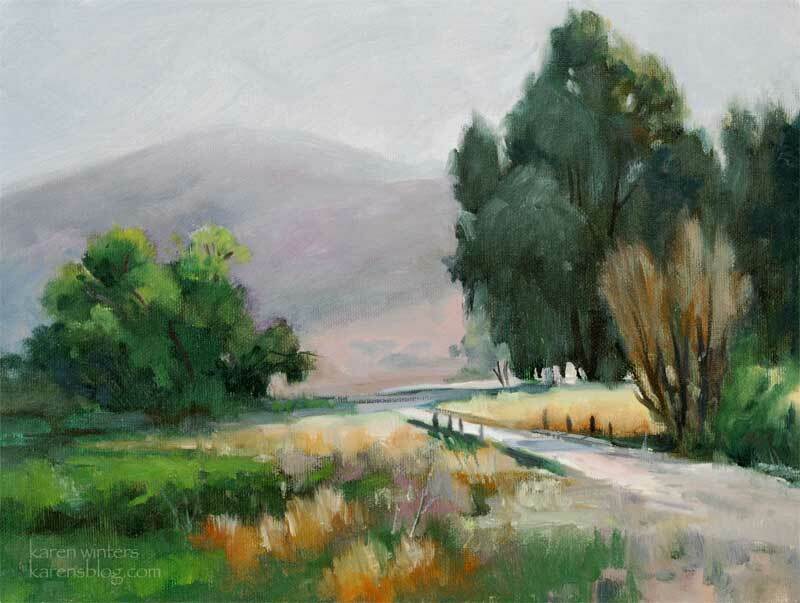 I’ll have original oils and watercolors, framed and unframed, as well as prints and cards. 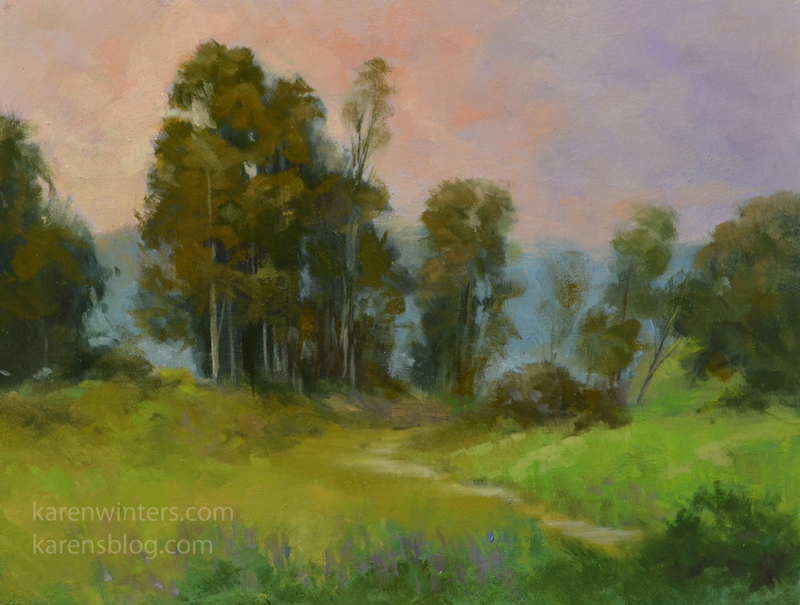 Because things have been so busy, I am posting a plein air painting that I did in late April, but I haven’t had time to get it photographed. 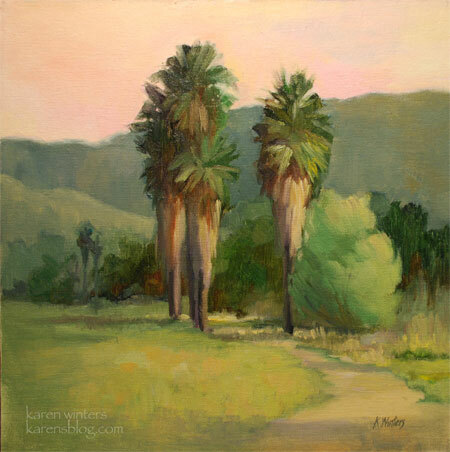 Three or four stately fan palms bordered a path through an open grassy ara. The late afternoon light wrapped everything in a warm glow. Pretty soon I’ll be back in the groove of everyday painting again. I miss it, but I have to take care of business, too. 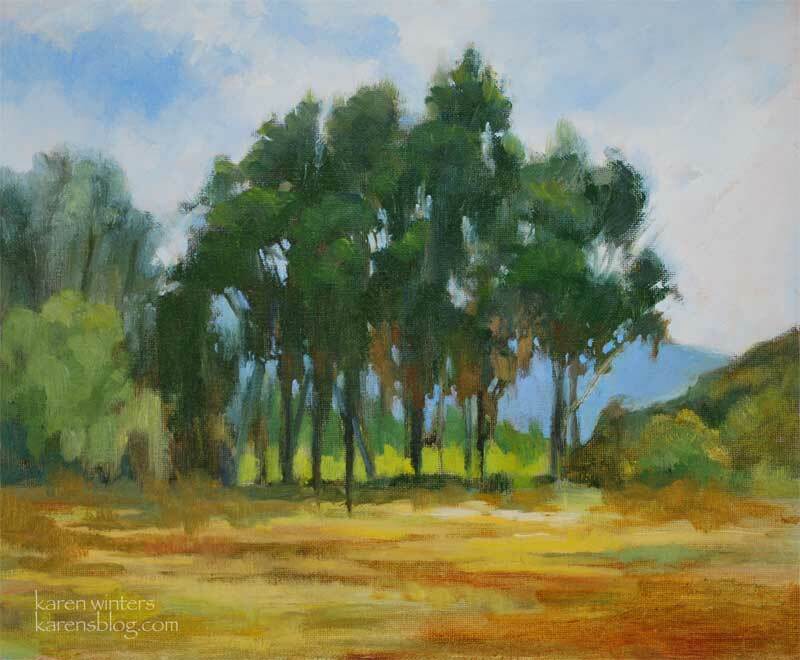 At the end of the first day of Libby Tolley’s workshop, which was held in the classroom, I was excited to get outside and find a location to paint. All day the temperatures soared into the high 90s, maybe even 100 degrees, and we were all relieved to paint and practice indoors. As evening came, it had cooled off enough to be tolerable. But on top of that there was a brush fire nearby which filled the air with smoke and gave the sky a warmer than usual color. The color combination was irresistible. What attracted me to this scene was the beautiful eucalyptus, and the layers of color and foliage disappearing in the smoke back to the distant mountain range. On any given day, the scene may have looked entirely different. A little earlier in the year and the foreground grasses would have been green. On a fire-free day the atmosphere would not have provided the interesting sky effects of warm and cool, intermixed. In the morning, everything would have been lit from the opposite direction. 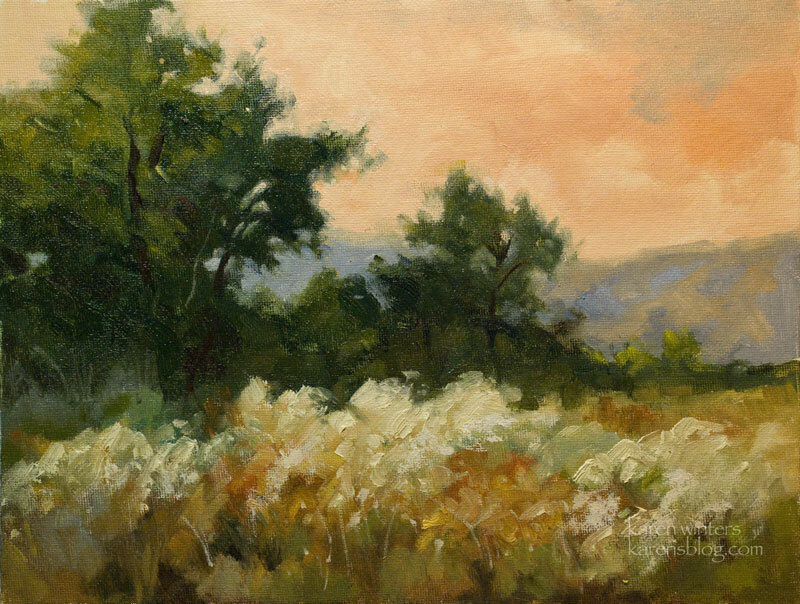 This is one of the things I love about plein air painting – the practice of capturing a very specific moment in time that may never occur again. While I was there, next to a curb on a culdesac where no houses were built, a man who lived nearby hailed me with a wave and I told him what I was doing. He and his sons came over to watch me paint for awhile, and then I packed my things up. It turns out he’s in the agricultural business and knew a number of places to paint where there are reflective pools of water. Like I’ve said before, I think I could be in the middle of the wilderness and still draw a crowd. It always happens and because I’m a social person, I don’t mind sharing my love of painting. As the week progressed in Fallbrook, the weather cooled and large clouds would appear every morning. 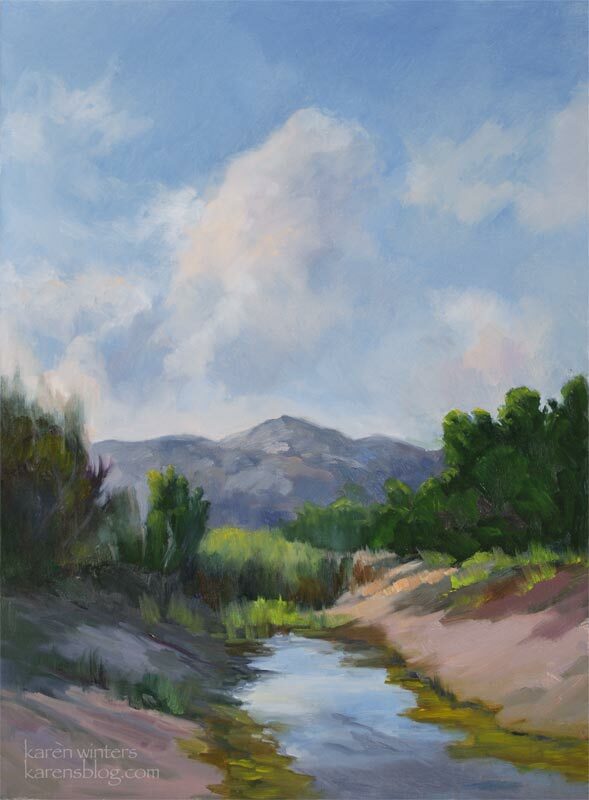 This painting, inspired by my visit there, depicts a view looking eastward across a small creek that helped irrigate the ranch where we were painting. 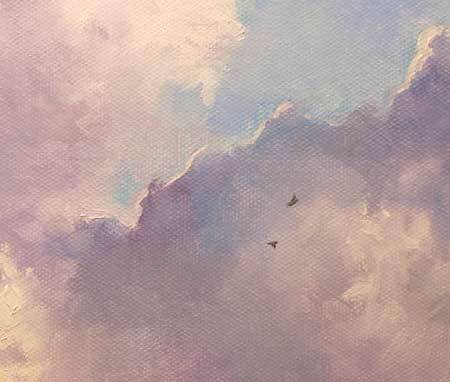 Clouds are among my favorite subjects to paint and in this case they are the primary interest. 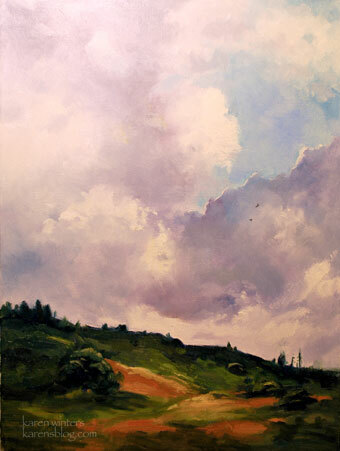 If this painting is dry, I might be bringing it to the Montrose Art Walk this Saturday on Honolulu Avenue in Montrose. I can’t promise, because it may not be dry enough. But on the other hand, at a plein air event, the patrons buy paintings at the end of a QuickDraw event, and they are soaking wet, painted just an hour before. So I might very well bring this one along.